It’s easy to be green! You can live comfortably without harming the air, water or habitats of our native plants and animals. Let us show you how to grow and prepare your own food or reduce your carbon footprint through recycling and composting. Learn how to make plant selections for your landscape that don’t sacrifice beauty for ecology. Find a new appreciation for simple, historical methods. MetroParks has programs, demonstrations and facilities that help you make better choices for the environment. The Barbara Cox Center for Sustainable Horticulture engages the community with opportunities for experiential learning about sustainability and horticulture to improve quality of life and to make positive change in the world. This working facility showcases methods for growing plants, from tree seeds to prairie plants, that are critical for maintaining your MetroParks. Stop by and get your hands dirty! According to LocalHarvest.org, most produce in the United States is picked four to seven days and is shipped an average of 1,500 miles before it reaches the supermarket shelves. By buying produce locally, you help reduce the carbon footprint, preserve our environment and strengthen our community by investing your food dollar closer to home. 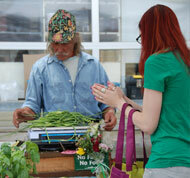 The 2nd Street Market offers local produce and other sustainable and upcycled goods year-round. A number of local CSAs are also available — and you could always grow your own! Visit our Food: Earth to Table section to learn more about how to get started. Possum Creek MetroPark’s Edible Farm is striving to become a leader in promoting small-scale food raising for the local community. From chickens to rabbits, honey to herbs, there’s so much more you can do with your yard than just grow fruits and veggies. Learn how at the farm. The century-old techniques of farm life at Carriage Hill’s historical farm may seem antiquated in today’s fast-paced, technology-filled world, but at their heart are concepts of sustainability that can be adapted to work in modern times — from weaving, quilting and sewing your own textiles to woodworking, soap-making, cooking and food preservation. Composting demonstrations are available at Cox Arboretum, Wegerzyn Gardens and Possum Creek. Each facility composts on site and offers visitors a chance to see how it works. To get started with your own composting, participate in our free Compost Kitchen program, offered quarterly, in which you’ll learn about soil science, get practical tips for making compost and learn how to use compost to create a sustainable growing system. Enjoy the best of in-season, locally grown vegetables, herbs and bedding plants brought to the Market straight from the field at the annual summer outdoor Farmers’ Market. Conventional and organic farmers will participate every Saturday. Learn more about the Market.